No hassle. Just free, no-obligation price information. Simplify your software selection with a custom quote below. Get your free price quote for NetSuite. 2. Select your industry Accounting Advertising Agriculture Auto Dealership Banking Construction Consulting Distribution Education Energy Engineering Food / Beverage Healthcare / Medicine Hospitality / Travel Insurance Legal Maintenance / Field Service Manufacturing Media Mortgage Non-Profit Pharmaceuticals Property Management Public Sector Real Estate Retail Software / IT Telecommunications Transportation Utilities Other services Other Please select your specialty. Your details are only shared with software vendors that are the right match for you. We use your email and phone number to ask further questions or to verify your identity. Where do we send your pricing info? Thank You! Your request has been received. Thanks! A software analyst will contact you to provide accurate pricing. 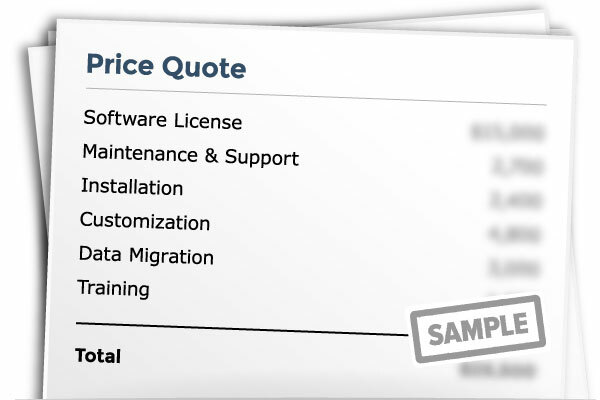 The pricing information we will give you includes the costs of software licenses, training, implementation services (if necessary) and computer hardware (if necessary). Pricing is usually based on the number of users or some other relevant measure. One of our software analysts will contact you shortly to ask some further questions in order to supply you with the most relevant and correct information. Want to schedule a specific time for your call?